Click here to know your Application status. Notice on Refund of Examination Fee_CEN 02-18. Notice on Revision of Vacancies and Preference of Posts for PwBD candidates. Revised PwBd vacancies of CEN-02/2018. Click here to modify bank account details for refund of exam fees. Notice on Refund of exam fees and correction of Bank Account. Notice on Publishing score sheet and QP with response. Notice on results of CBT2. 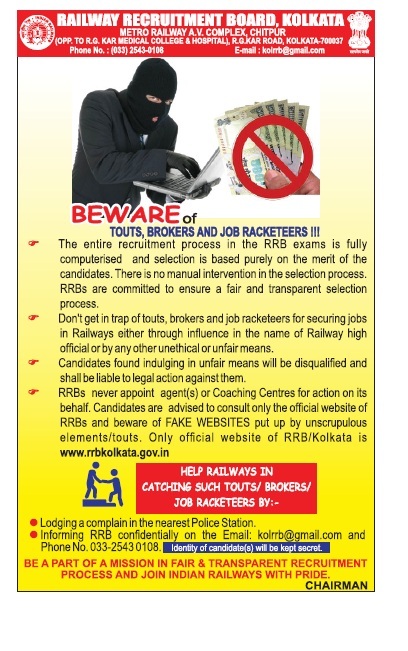 Indicative Notice for 4 Employment Notices for various posts in Railways. (ENGLISH VERSION).